Style and glamour took centre stage in Johannesburg on Thursday, 02 July when Huawei introduced its latest masterpiece, the P8 smart phone at the Johannesburg Country Club. Johannesburg is the latest stop in a worldwide tour that has included stops in Bangkok, Singapore, New York and London, with newly appointed GM of Huawei Consumer Business Group SA, Charlene Munilall unveiling a smart phone that flawlessly balances artistry and creativity. The P8 embodies classic yet inspiring design, class-leading technology and ease of use that is bound to amaze and inspire its users. The Huawei P8 is undoubtedly the smart phone of choice for the fashion-conscious, visually stimulated modern user. The P8 will be available in South African stores and through all network operators from the second week of July. The P8’s outward appeal lies in its sleek, classical design that reflects its users’ sense of style and appreciation of performance and usability. Combining elegance, craftsmanship and durability, the P8 is manufactured using the latest Nano-injection moldings technology to deliver a one-piece aluminum body. The sleek design combines comfort and ease of use, with the beveled body measuring a mere 6,4mm in height and weighing only 144g. Catering to the fashion conscious consumer who delights in choice, the Huawei P8 is available in silver, gold, black and grey. The P8’s 5.2’’ full HD display with a 1080p resolution completes the design of a handset that redefines elegance and a fully immersive experience. 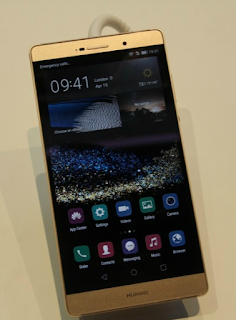 The Huawei P8 is optimized for 4G/LTE data connections as well as enhanced network roaming - which is performed nearly three times faster than competitor phone models. Huawei is a leading global information and communications technology (ICT) solutions provider with the vision to enrich life through communication. Driven by customer-centric innovation and open partnerships, Huawei has established an end-to-end ICT solutions portfolio that gives our customers competitive advantages in telecom and enterprise networks, devices and cloud computing. Huawei’s 150,000 employees worldwide are committed to creating maximum value for telecom operators, enterprises and consumers. Our innovative ICT solutions, products and services have been deployed in over 170 countries and regions, serving more than one third of the world's population. Founded in 1987, Huawei is a private company fully owned by its employees.